Half term is fast approaching and so this week on Parent Info, we have provided some tips on how parents can teach some valuable internet safety tips while enjoying the extra time with their children. The schools will soon be breaking up, but don’t panic – help is at hand! Social media has been blamed for spreading news of fights among schoolchildren. How can you help your child if they are involved? It’s estimated that around 290,000 children in the UK suffer from this debilitating and upsetting condition. Here are some tips to help you to help them. How to protect your child if they are asked to share sexual images online. Why do young people like it – and what are the risks. Remember, if you take Parent Info as an RSS feed, don’t forget to check it regularly for new content. We update it weekly, usually on a Thursday afternoon, so don’t miss out on the latest articles and information for parents. If you use an iframe feed to access Parent Info, this will update automatically. If you have any comments or questions about Parent Info, please drop us an email at support. 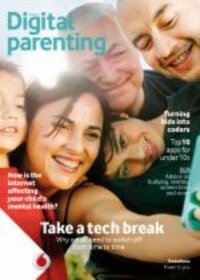 The new issue of Digital Parenting magazine is out – edited by the Parent Info team, supported by Vodafone and free for schools to give out to parents. In this fourth edition, find articles on cyberbullying, whether online games are damaging your child, what technology is right for different stages and how parents can make the most of their children’s digital future – along with nine practical pages of how-to guides to setting up parental controls. You can order your free copies – as many as you need – on Parent Zone’s website. Copyright © 2015 Parent Zone, All rights reserved.